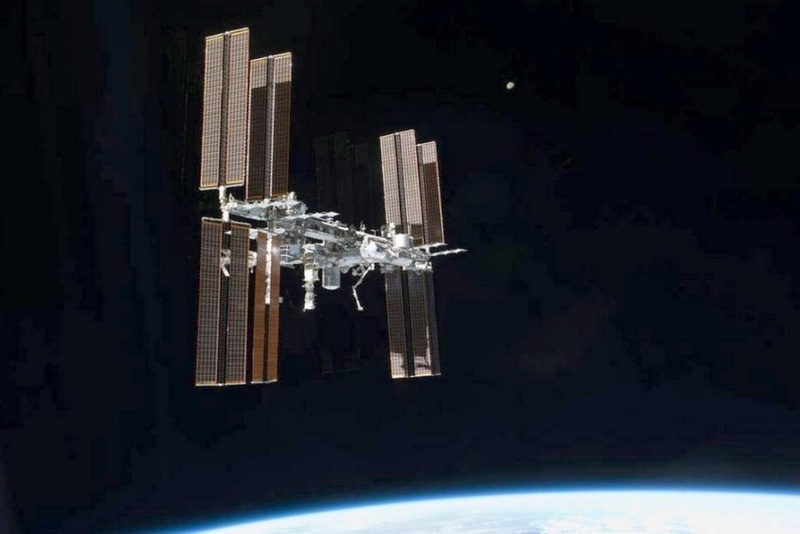 Excellent photo from a NASA website, of ISS taken from the now-retired US Space Shuttle, back in 2011. This is well-engineered technology. We should actively use it as a base for orbital parking of fuel for trans-planetary exploration and colonization ships. The idea should be to lift multiple supply ships with fuel, until sufficient quantity is held for round-trip Martian runs. 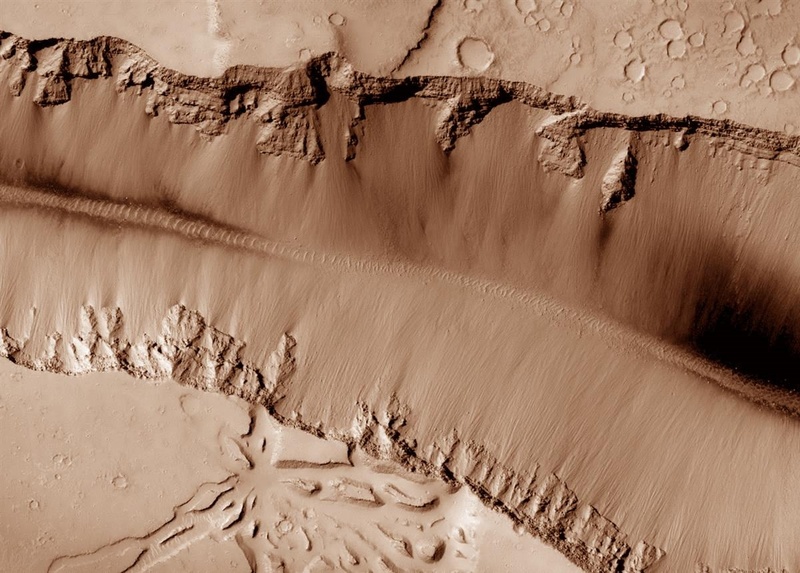 We probably need 10 to 15 runs just to drop enough materiel on the Martian surface to support a first colony. Elon Musk is right. We need to get moving on this project now. There is a whole planet waiting - free for the taking. 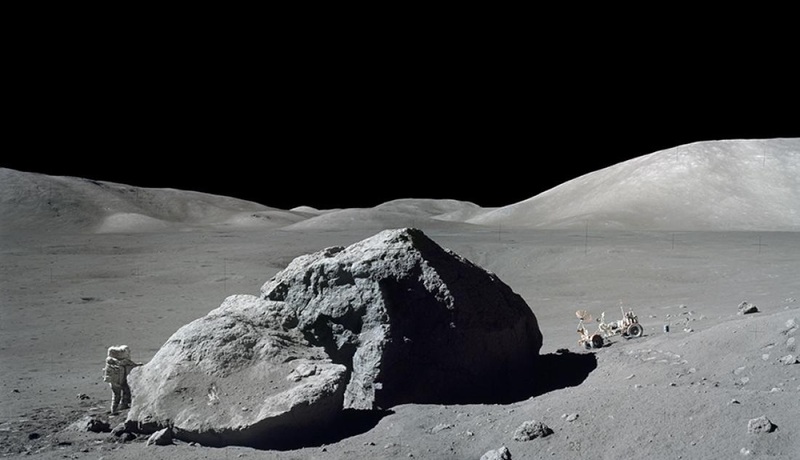 Note the moon in the background, where a car remains parked, from the last US Lunar mission - Apollo 17, way back in December of 1972 - 45 years ago! 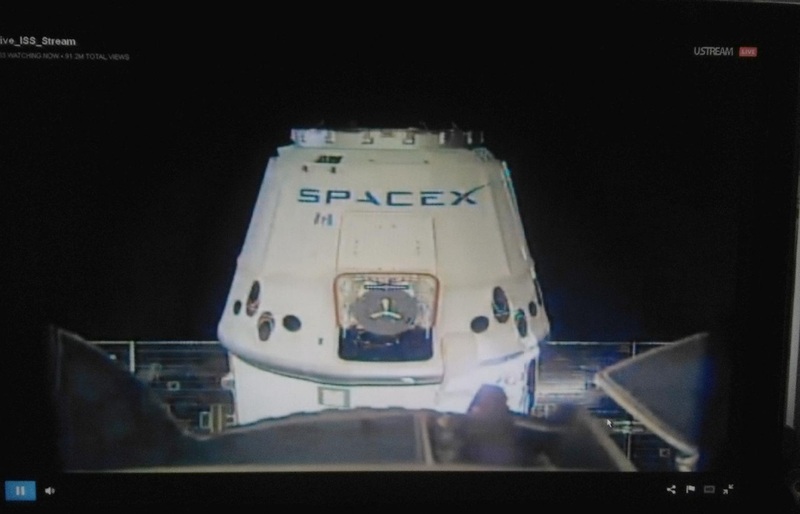 Fantastic Live Image of the SpaceX Dragon Ship, 11 meters from the International Space Station, about to be Captured by the Robotic Canadarm - June 5, 2017. I captured this image using a cellphone camera, right off the Samsung monitor, while watching it real-time. The successful capture was made at 8:52 Central Time, just over coast of Argentina. 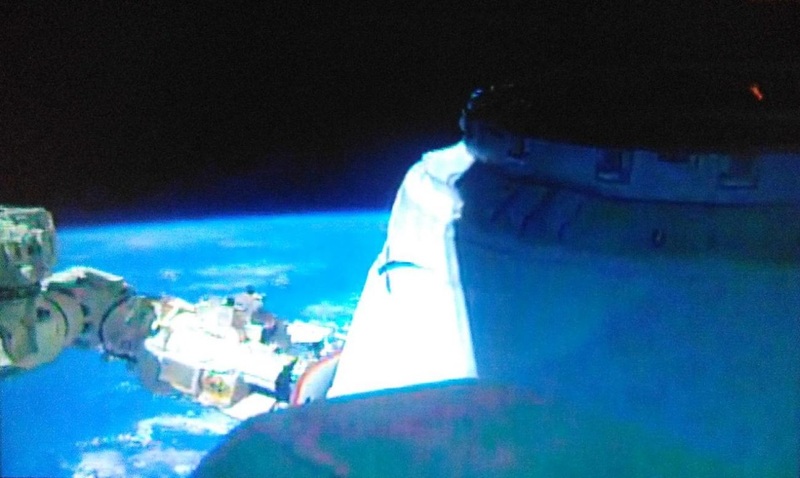 This was first reused space vehicle to dock with the ISS, since Shuttle Atlantis docked in 2011. 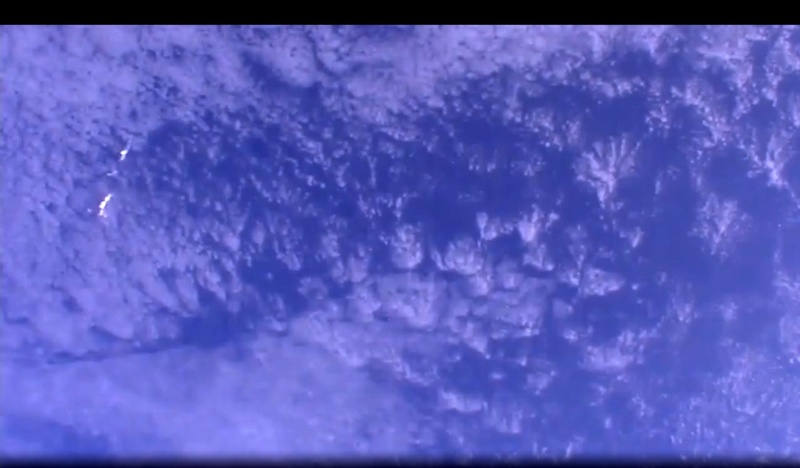 The live video coverage was very well done by the NASA feed. 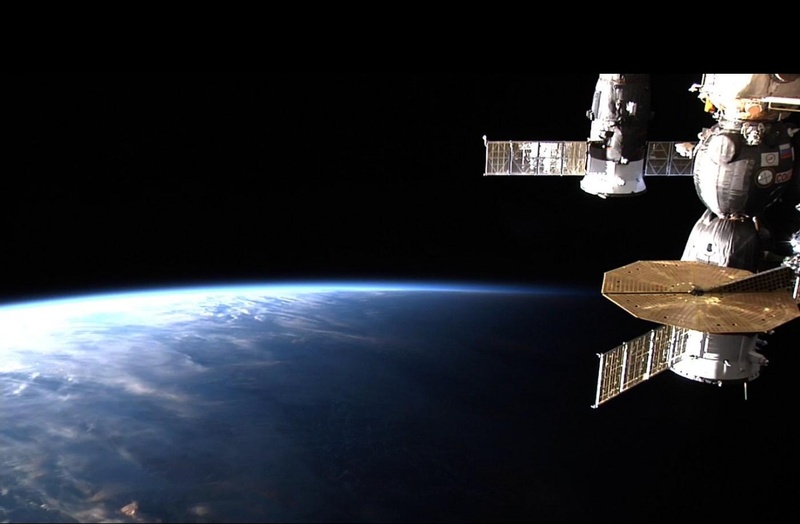 This impressive Orbital Ballet shows what is possible when technology allows human initiative to be enhanced and extended. 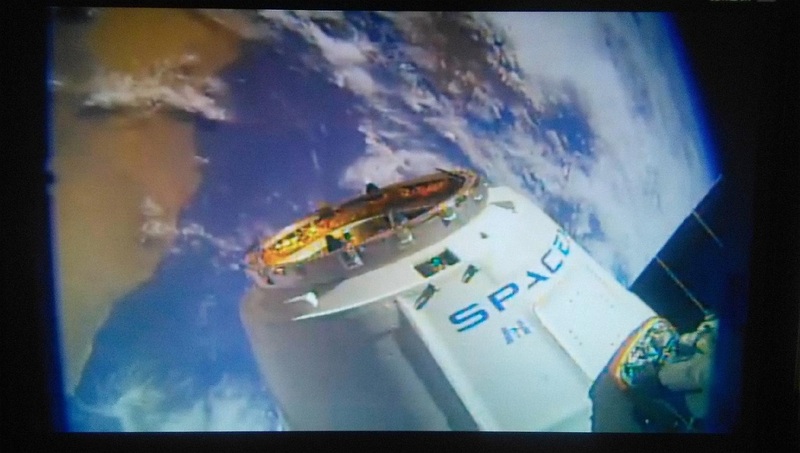 Robotic "Canadarm" Reaching Out to Catch the Dragon! (June 5, 2017. 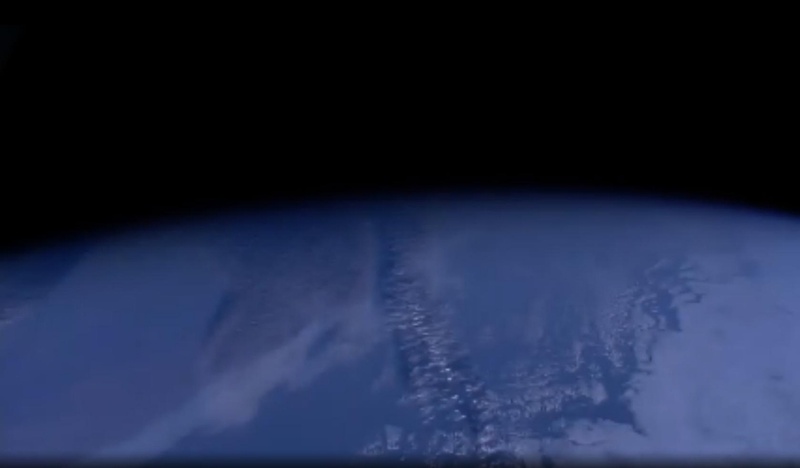 Photo frame-captured from NASA video. 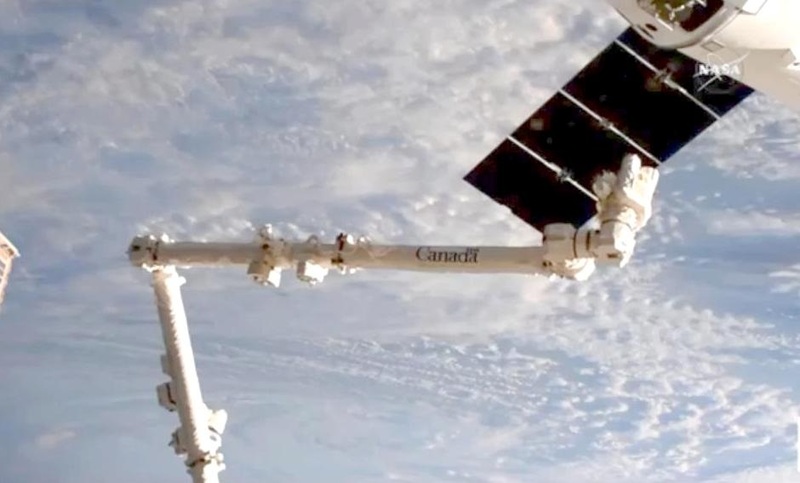 Real-time video-capture of Canadarm linked to SpaceX Dragon ship, June 5, 2017. 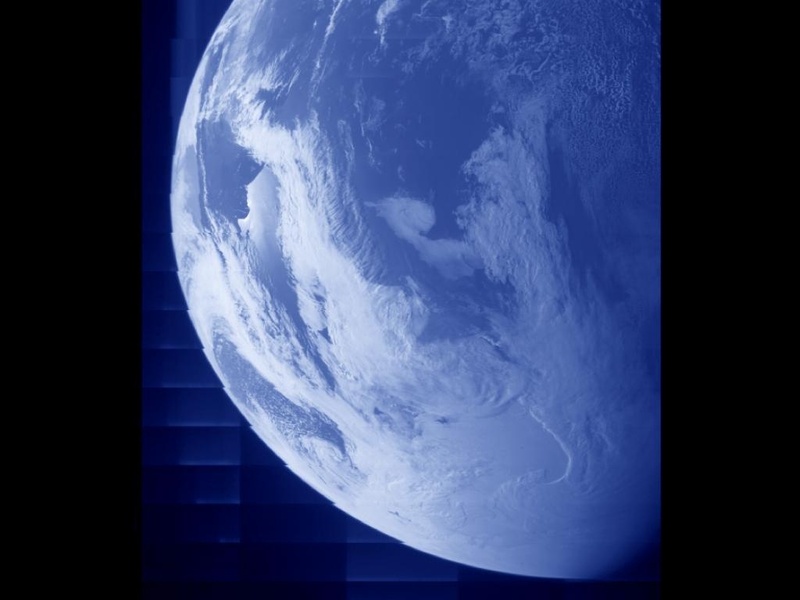 Earth As Seen from the NASA Juno Probe Before Orbital "Slingshot"
It is possible to download the image data from the NASA Juno Probe, which as of Sept. 6, 2016, is in orbit around the planet Jupiter. 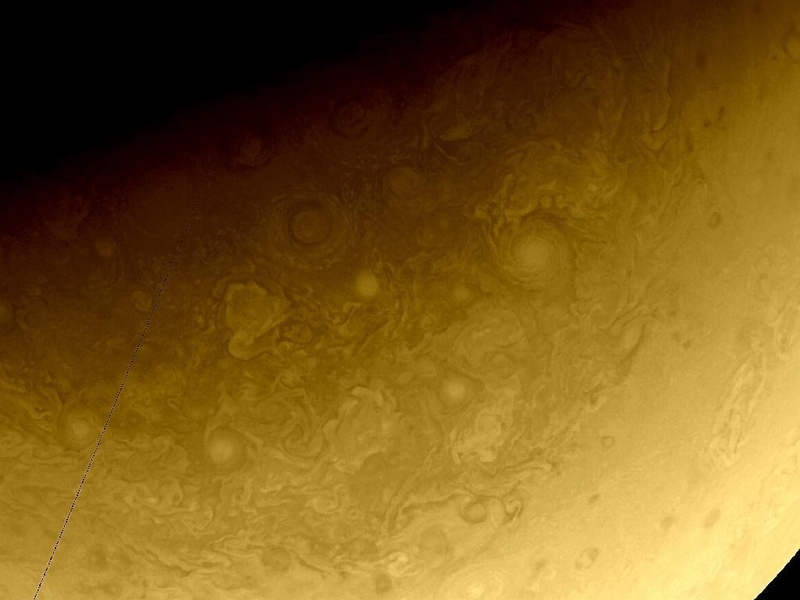 I pulled down a few of the more dramatic images, and tweaked the gamma and contrast to make the fractal violence of the Jovian atmosphere a bit more evident. There is also a magnificant flyby picture of Earth (above), taken when the probe did its gravity "slingshot" around Earth. 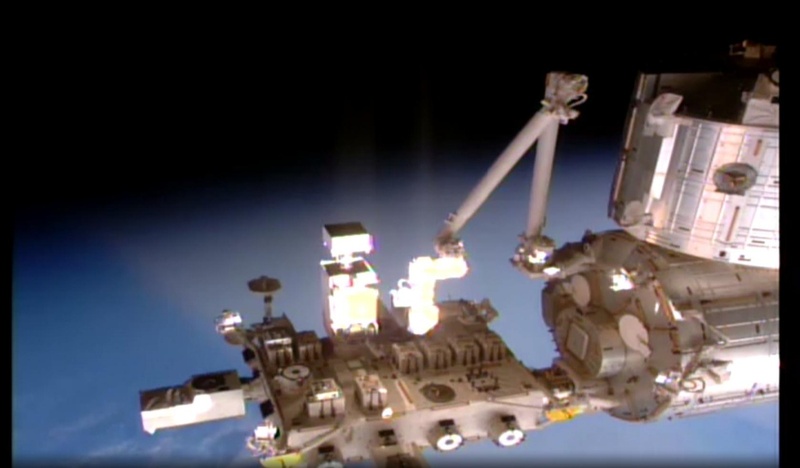 Research Platform on the ISS, terminator in background. The HDEV Experiment - "High Definition Earth Viewing" - gives everyone the ability to monitor video feeds from the ISS. The images transmitted are interesting, and show the range of planetary environments evident on Earth. The images of cloud formation provide an interesting example of dynamic fractal geometry, an emergent process that shows how extreme complexity can arise from random systems driven by simple rulesets. 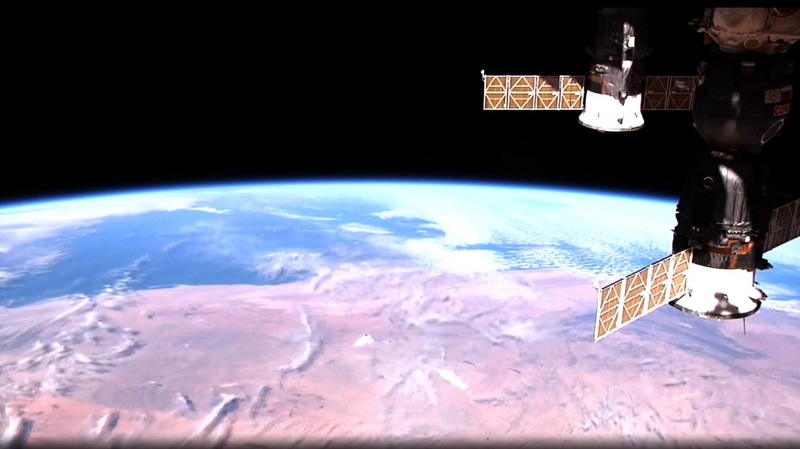 The HDEV feeds are available from a number of sources, and allow real-time external views of Earth, from various camera locations on the ISS. These pictures provide accurate, unfiltered images of what our small home in the dark void of space actually looks like. 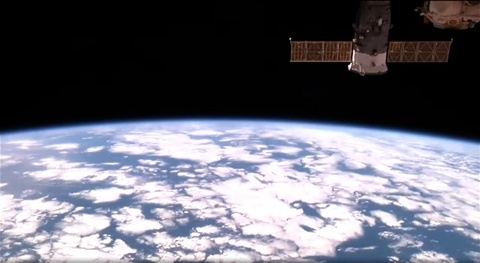 This "high ground" view of our planet is perhaps the primary mission of the ISS. These images allow us to change our perspective. This change in viewpoint assists in the transition of the human species from a superstitious and ignorant group of chattering savages, to an intelligent and skeptical space-faring civilization. We must dump all our religions and foolish superstitions into the dustbin of history, and embrace a science-driven future that takes us all forward. 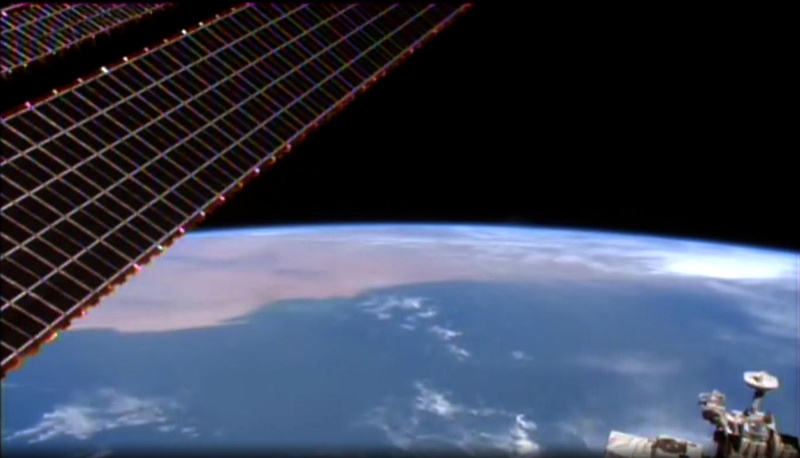 West Coast of Africa - January 10, 2017, from ISS HDEV (High Definition Earth Viewing) Experiment. 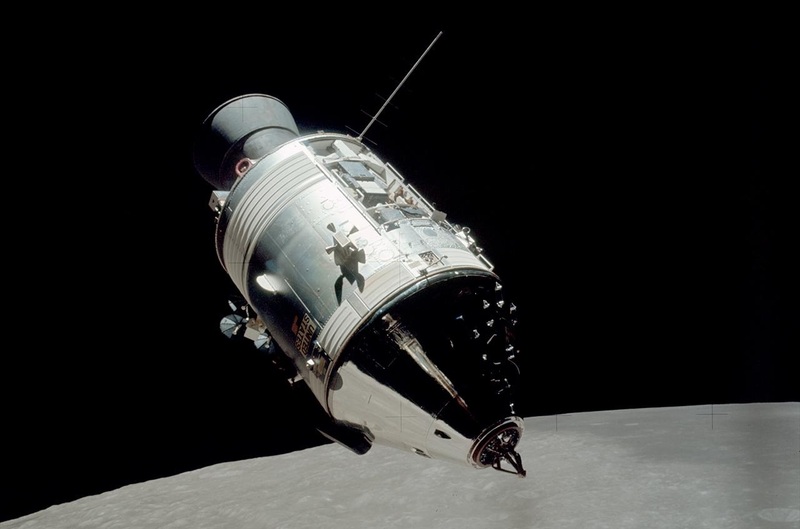 Apollo 17 Lunar Orbital Spacecraft. This was a damn fine little ship, which flew 45 YEARS AGO, way back in December, of 1972. It was designed using drafting tables and detailed engineering drawings. It remains the best interplanetary exploration vehicle human beings have ever developed. 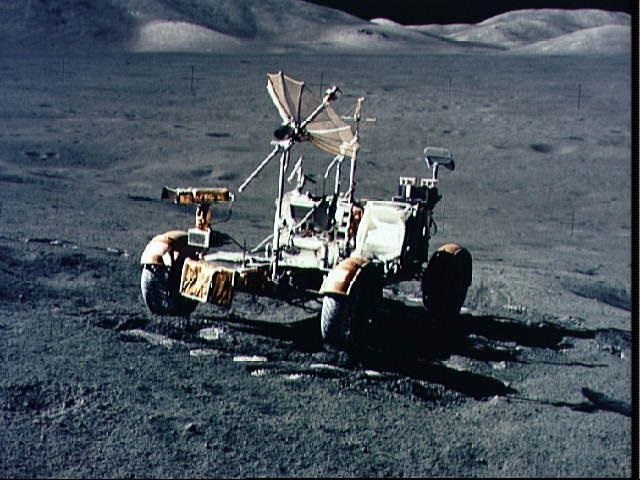 Eugene Cernan, who died this year on January 16th, 2017, was the last to drive the Lunar Rover, back in December, of 1972. It remains parked on the moon. Astronauts of the Apollo 17 Lunar Exploration Mission, conducted in December of 1972, explore the Lunar surface, using the Rover. This was a last manned interplanetary space exploration mission undertaken. As of October, 2017, humans have used only robot probes to explore their own planetary backyard.